28 Liberty Street, formerly known as One Chase Manhattan Plaza, is a banking skyscraper located in the downtown Manhattan Financial District of New York City, between Pine, Liberty, Nassau, and William Streets. Construction on the building was completed in 1961. 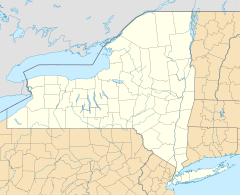 It has 60 floors, with 5 basement floors, and is 248 meters (813 ft) tall, making it the 26th tallest building in New York City, the 43rd tallest in the United States, and the 200th tallest building in the world. The building is built in the International style, with a stainless steel facade with black spandrels below the windows. Designed by Gordon Bunshaft of Skidmore, Owings and Merrill, the building echoes the firm's earlier Inland Steel Building in Chicago. 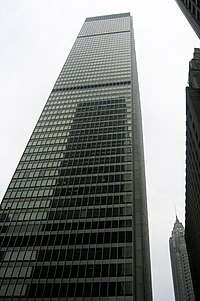 The Chase Manhattan Bank president of that time, David Rockefeller, the late patriarch of the Rockefeller family, was the prime mover of the construction and the building's location, notably because many corporations had moved uptown, and the Financial District had languished as a result. It was begun in 1956 and completed in 1961. In 1970, Chase installed a monumental sculpture entitled "Group of Four Trees" by French artist Jean Dubuffet in the building's plaza. At the time, the 40 feet (12 m) tall sculpture was the largest outdoor, public artwork in New York City, beating out Pablo Picasso's "Bust of Sylvette" by 4 feet. The artwork joined a sunken Japanese rock garden by artist Isamu Noguchi which had been present since the building's opening. In 1991, Chase embarked on a comprehensive renovation plan for the building, the first major overhaul since its opening 30 years earlier. The bank spent $30 million to clean the building's exterior, upgrade elevators, remove asbestos, remodel the lobby and improve the heating and cooling systems. The same year, the building lost major tenant Davis Polk & Wardwell which moved to 450 Lexington Avenue. The departure followed fellow law firm Cravath, Swaine & Moore's move from the building a year earlier. The New York City Landmarks Preservation Commission designated One Chase Manhattan Plaza a landmark in 2008. On October 18, 2013, JPMorgan sold the building to Fosun, a Chinese investment company, for $725 million. Fosun rebranded One Chase Manhattan Plaza as 28 Liberty Street in 2015. The new name refers to the east-west street on which the building sits but also connects to the Statue of Liberty in the distance and to "the good fortune that, according to Chinese tradition, is bound up in the number 8 [and] 28 denotes 'double prosperity'". Fosun invested $150 million into reconfiguring the building's ground and lower floors into a 200,000 square feet (19,000 m2) retail complex. The renovations included a 35,000 square feet (3,300 m2) food hall on the ground floor as well as a 45,000 square feet (4,200 m2), 10-screen Alamo Drafthouse Cinema in the below-ground space. In 2018, Danny Meyer opened "Manhatta", a restaurant and event space taking up the building's entire 60th floor. looks bulky among the slender towers of pre-Depression skyscrapers. Its surface can also appear obtrusive because the earlier building surfaces of brick and stone absorb light while Chase's aluminum and glass reflect it. Seen from ground level, especially from its principal plaza, the building is a commanding presence. A direct entrance to the Wall Street station (2 and ​3 trains) of the New York City Subway is in the lobby. 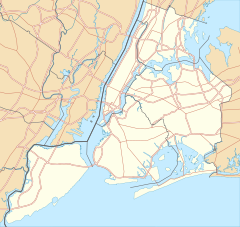 There are also connections to Wall Street (4 and ​5 trains) and to Broad Street (J and ​Z trains) via passageways underground. ^ Morris, Keiko, "A Landmark Office Tower in Lower Manhattan Reimagined" (subscription), Wall Street Journal, March 11, 2015. ^ a b Morris, Keiko, "Downtown Tower Gets a Symbolic New Name" (subscription), Wall Street Journal, January 11, 2015. Retrieved 2017-03-20. ^ Shirey, David (November 24, 1970). "Dubuffet Is Doing 40‐Foot Sculpture for Chase Plaza". The New York Times. ^ a b Garbarine, Rachelle (September 25, 1991). "Real Estate; Chase Bank Renovates to Lure Tenants". ^ "One Chase Manhattan Plaza (aka 16-48 Liberty Street, 26-40 Nassau Street, 28-44 Pine Street, 55-77 William Street) Archived 2016-03-04 at the Wayback Machine, Landmarks Preservation Commission, February 10, 2009. ^ Levitt, David M. (2013-10-18). "JPMorgan Sells Chase Manhattan Plaza in NYC to China's Fosun". Bloomberg. Retrieved 2013-11-27. ^ Bindelglass, Evan, "Landmarks Wants Re-Think of Re-Development At 28 Liberty Street", New York YIMBY, May 6, 2015. ^ Cuozzo, Steve (January 21, 2019). "Massive food & entertainment skyscraper coming to FiDi". New York Post. ^ Fabricant, Florence (July 17, 2018). "Room With Quite a View: Danny Meyer's Manhatta". The New York Times. ^ a b Krinsky, Carole Herselle, Gordon Bunshaft of Skidmore, Owings & Merrill (New York: The Architectural History Foundation, 1988) excerpt (pp. 72-74, 76) at greatbuildings.com. 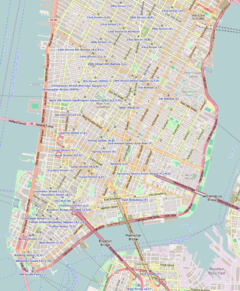 ^ "MTA Neighborhood Maps: Lower Manhattan" (PDF). mta.info. Metropolitan Transportation Authority. 2018. Retrieved October 1, 2018. ^ "Office Details". Agcs.allianz.com. 2012-06-12. Archived from the original on 2016-02-06. Retrieved 2013-11-27. ^ Schram, Lauren (January 20, 2017). "Attorney General Eric Schneiderman Nails Down 345K-SF Deal at 28 Liberty Street". Commercial Observer. ^ La Guerre, Liam (November 8, 2017). "Travel Website Booking.com Takes 53K SF at 28 Liberty Street". Commercial Observer. ^ a b Rizzi, Nicholas (January 25, 2019). "Fosun Signs Three Tenants to 170K SF at 28 Liberty". Commercial Observer. ^ Cullen, Terence (August 5, 2015). "Insurance Company Doubling Space in Liberty Street Move". Commercial Observer. ^ La Guerre, Liam (June 7, 2016). "Law Firm and JLL Sign Leases at Fosun's 28 Liberty Street". Commercial Observer. ^ Schram, Lauren (October 5, 2018). "London Stock Exchange Consolidating Manhattan Locations in 75K SF at 28 Liberty". Commercial Observer. ^ Geiger, Dan. "EXCLUSIVE: In a Reversal, Law Firm Milbank Tweed Considers a Renewal". Commercialobserver.com. Retrieved 2013-11-27. Wilson, John D. (1986). The Chase: The Chase Manhattan Bank, N.A., 1945-1985. Boston, Mass: Harvard Business School Press. ISBN 978-0-87584-134-2. 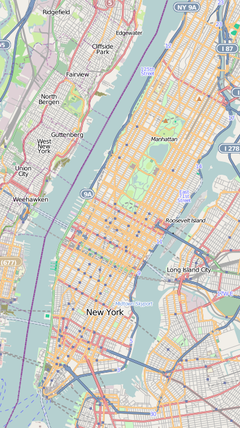 Wikimedia Commons has media related to One Chase Manhattan Plaza. This page was last edited on 23 April 2019, at 05:17 (UTC).